Which edition of Windows 10 will you get for free? 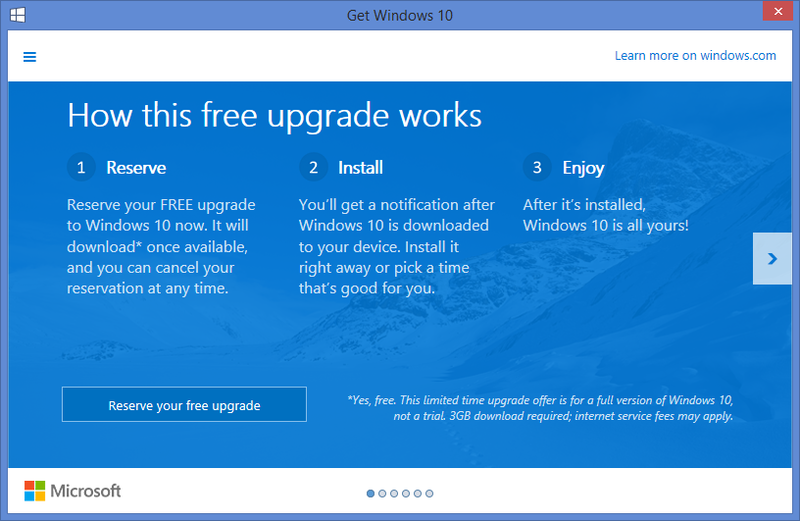 Microsoft is doling out Windows 10 as a free upgrade to users running Windows 7 or 8.1. But the edition of Windows 10 that you receive will depend on which edition of Windows you're running now. Microsoft is counting heavily on Windows 10 to erase the bad memory of Windows 8. As such, the company has made the unprecedented move of offering it as a free upgrade for the first year in hopes of drawing in as many users as possible. Windows 10 also provides a more unified environment among PCs and mobile devices, so Microsoft is hoping the new OS will trigger greater demand for Windows PCs,tabletsand mobile phones. Windows 10 will be available in Home and Professional editions, as well as an Enterprise version for big businesses. So which edition of Windows 10 will you get as part of your free upgrade? A reader asked me this question the other day, so I thought it'd be worth a look. On its Windows 10 Q&A page, Microsoft tried to address many of the common questions about Windows 10 and the free upgrade. One section in particular called "What edition of Windows will I get as part of this free upgrade?" responds to that very question. Microsoft's Windows 10 Specifications page also answers this question. But basically, the edition you receive will be comparable to the edition you already run. Those of you who currently run Windows 7 Starter, Windows 7 Home Basic or Windows 7 Home Premium will be upgraded to Windows 10 Home.Those of you running Windows 7 Professional or Windows 7 Ultimate will be upgraded to Windows 10 Pro. Those of you running Windows 8.1 (the standard edition) will receive Windows 10 Home. And those of you running Windows 8.1 Pro or Windows 8.1 Pro for Students will receive Windows 10 Pro.On the mobile phone side, if you're running Windows Phone 8.1, you'll get Windows 10 Mobile as your free upgrade. So what are the differences between Windows 10 Home and Windows 10 Pro? A Microsoft blog post from May 13 described each edition. Windows 10 Home is the "consumer-focused" desktop edition aimed at PCs, tablets and 2-in-1 devices. Windows 10 Pro is also geared for PCs, tablets and 2-in-1 devices but throws in extra features for small businesses, such as the ability to manage your users' devices and use the remote desktop tool to log onto and control another PC. There are some caveats and conditions with the free upgrade. If you're using Windows 7, you must be running Service Pack 1 in order to receive the free upgrade. Windows 7 Service Pack 1, or SP1, has been available as an update since 2011, so you should already have it installed. To check, click the Start button in Windows 7, right-click the setting for Computer. Click Properties from the popup menu. The screen to View basic information about your computer should list Service Pack 1. If not, you can download it directly from Microsoft's Download Center. If you're still running Windows 8.0, you'll have to upgrade to Windows 8.1 to get Windows 10 for free. To check this, open the Apps screen, scroll or swipe to the right of the screen until you see a tile for "This PC." Right-click that tile and click Properties from the popup menu. The screen to View basic information about your computer should list Windows 8.1. If not, you can upgrade to 8.1 by launching the Windows Store app where the 8.1 update should still be waiting for you. Some Windows editions are not eligible for the free Windows 10 upgrade. These include Windows RT/RT 8.1, Windows 7 Enterprise and Windows 8/8.1 Enterprise. The Enterprise editions are geared toward large organizations, which typically have their own licensing agreements with Microsoft. Windows 10 will be available as a free upgrade starting July 29. But that free upgrade is good only for one year as of that date. Once that first year is over, a copy of Windows 10 Home will run you $119, while Windows 10 Pro will cost $199. And for those who want to upgrade from the Home edition to the Pro edition, a Windows 10 Pro Pack will cost $99. Microsoft has already been pushing the new OS to Windows 7 and 8.1 users through a Get Windows 10 system tray icon that prompts you to reserve your free copy of Windows 10 so it's automatically downloaded come launch date. You don't have to reserve your copy now but if you want Windows 10 for free, just remember to download and install it before that first year is up. © 2015 E-Forge Solutions Ltd, All Rights Reserved.